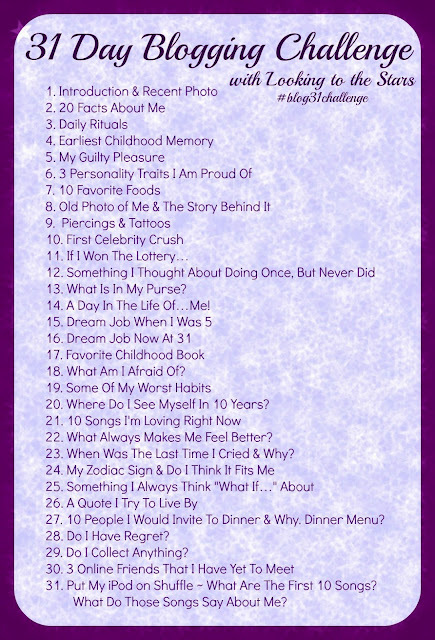 Day 2: 20 Facts about me. This one was kinda hard. I mean, I knew the major ones about myself, but after #5, I had to get my Mr. to help. 1. I'm Cajun, something that, as I move around the world, I realize this is a unique heritage and I love it dearly. 2. I'm a Christian. I grew up Catholic, and after yearning for more, I've started going to a non-denominational church. I enjoy getting a little more bible study in my life. And now, I'm going to school to get my Theology degree and I couldn't be happier! 3. I am odd, quirky, eccentric, as pretty much all artists are. BUT, I have a heart as big as Texas, so please don't call me weird! 4. My toes must have a nice pedi at all times, but I rarely put polish on my fingers, it always seems to chip like 1 hour after drying! Anyone else had this problem? 5. I feel weird talking about myself all the time, but I have a blog...it makes no sense! 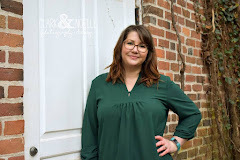 I'm working on letting more of my personal life into the posts, just for ya! 6. Some say I have a dry sense of humor. I'm not sure if I agree with that! I am an odd ball, and what I find funny, some may not. Example: Will Ferrell cracks me up to no end! And once my "Giggle box" gets opened, I will laugh until I cry and can't breathe. Then, I will break out my inhaler because I will be having an asthma attack. After the attack is gone, I will commence laughing about the attack. 8. You could say I'm a girlie girl. I love makeup and skin care products, pink, glitter, lace; all things girlie! 9. You could also say I'm a tomboy. I love shooting guns, sloshing around in my rubber boots, hunting, fishing, and camping! 10. I love the ocean. Always have, and living in Hawaii for those few years solidified that love. I'm torn between living by the ocean, in the future, or in the woods. Half way there folks, hang in there! 11. I was a professional photographer at one point in time. Sadly, I don't practice that craft nearly enough. (Hey, if you're ever in Illinois, and want your picture taken, let me know! I'd love to practice on folks!) One of my goals for 2015 is to practice and share my photography more on here! 12. Cooking & baking is my jam! Love to experiment with new recipes. My gumbo is also the jam, period. 13. I also love sewing. My great grandmother taught me and I have been sewing my little heart out ever since. Recently, I just bought my first embroidery machine and boyyyyyyyyyyyyyyy is that thang fun! I can't wait to embroider everything and sell all things embroidered! 14. My Mr.'s nickname for me is "Hummingbird" because, in his words, "Both for how you fly from obsession to obsession and how pretty you are." He's so cute, and so right. I do jump in excitedly when I find something new to fixate on. 16. Battlestar Galactica and Gilmore Girls are my absolute favorite shows! 17. I've had many failed relationships. It was tough, and I clung to my faith to get me through. Which, once I allowed God to lead me (and that was tough for my Type A personality) he lead me to Hawaii to meet my soul mate- my Mr! 18. I have battled Stage 4 Endometriosis for 21 years of my life, finally diagnosed at age 18. It caused me to have a hysterectomy, and we will have to adopt to have children. I was also just diagnosed with Fibromyalgia, and all of this causes us to deal with lots of doctors and appointments and surgeries and medicine. It also causes us to turn down a lot of plans with others even though I would love nothing better than to go out and enjoy our friends and family. When I talk about these things, I wish not for your pity, but prayers for strength for me and my Mr. to deal with the hand I was dealt. God has his reasons for all of this, and I accept that. But, if I had a healthy body, I would probably rule the world, not even kidding! 19. Pajamas = lounge wear you sleep in, or put on after your nightly shower. Lounge wear = lounge wear you wear during the day. These technically could be the same articles of clothing, but have different names if worn different times. The Mr. doesn't get this, but it's legit. 20. I have always had a bad case of wanderlust and I'm so thankful God sent me my Mr., who also has a case of the wanderlust. This is a blessing and a curse as we talk about travel and where we will eventually end up and retire. Except we can't decide on a place and will, most likely, get a tiny house and travel from state to state, seeing everything we possibly can. DONE! I hope you enjoyed getting to know me a little better. Tell me a fact about you! Comment below. I have the same problem with manicures also, but always love a good pedi. Loved this look into your life. Thanks for the glimpse. These are all great facts! It's always fun to get to know people.